Order your own copy of the Elemental Cycle Dynasty Packs at your local retailer or online through our website today! Like the Imperial Cycle before it, the Elemental Cycle will be released over the course of six weeks, with one pack hitting store shelves every Thursday starting in the third quarter of this year. Whereas the Imperial Cycle invited you to journey into the capital city, the Elemental Cycle places on emphasis on the five elemental rings of Air, Earth, Fire, Water, and Void. 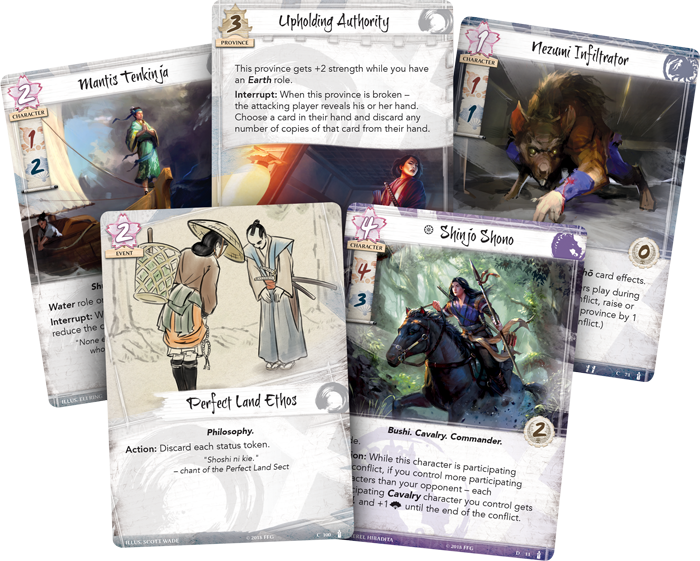 These elements have been thrown out of balance in the world of Rokugan, and you'll find their themes running throughout this cycle. The first five Dynasty Packs of the Elemental Cycle all correspond to a different element and how each clan relates to it, with neutral cards representing various creatures and spells associated with the element. 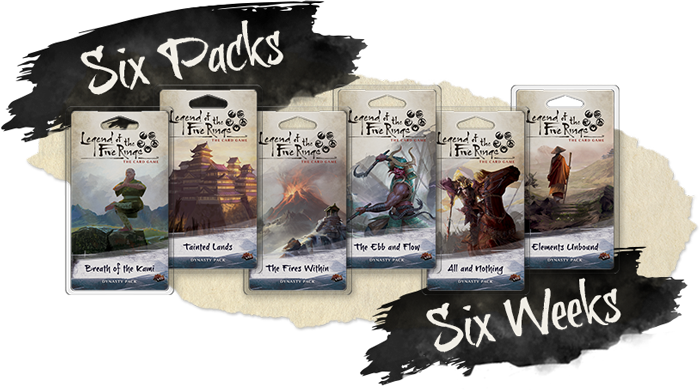 These five Dynasty Packs build toward the sixth pack, which ties the cycle together, focusing on a mix of all five elements. 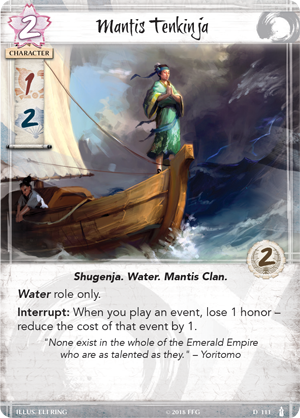 Over the course of the Elemental Cycle you will see ancient creatures return to the Emerald Empire, a new set of provinces that receive a boost based on your clan’s role, and a minor clan seizing control of its destiny and taking part in the military and political battles of Rokugan. While the Imperial Cycle focused on the human element of Rokugan with the various clans' relationships to the Imperial City of Otosan Uchi, the Elemental Cycle pulls the curtain back on various Creatures and ancient beasts associated with each clan. On the fringes of Rokugani civilization live the Nezumi, rat-like creatures that scurry through the Shadowlands, disdained by those who consider themselves of higher standing in the celestial order. Still, the Nezumi see themselves as a proud and heroic species with a history marked by tragedy, and the Crab have learned that they can be useful allies in the ongoing war against the Shadowlands. The Nezumi Infiltrator (The Ebb and Flow, 71) is a one-cost character immune to the effects of both Shadowlands and Mahō. As a conflict character, the Nezumi Infiltrator can be played in the middle of a conflict as a surprise participant—and he provides much more than just one political or military skill. Whenever this character enters play during a conflict, you can raise or lower the strength of the attacked province by one. This means you can either bolster your defenses or lower your opponent’s, and because province strength is a much more permanent fixture than your cumulative skill, this buff is almost guaranteed to last throughout the conflict. Before humanity became the dominant race of the mortal realm, five races ruled the world that would become Rokugan. These races now reside in disparate corners of Rokugan, shadows of their former selves but as dangerous as ever. This includes the Ningyo, who dwell in the deep waters lapping at the shores of the Emerald Empire. The Feral Ningyo (Tainted Lands, 36) is another conflict Creature that can be used as a nasty surprise for the enemies of the Phoenix Clan. During a Water conflict, you may put this character from your hand into the conflict, circumventing its fate cost. Adding three military skill or two political skill to your side of the conflict for free is a powerful ability, but it comes with a drawback. 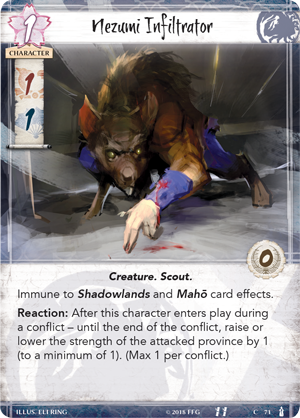 The Feral Ningyo retreats back into the depths of your deck at the end of a conflict, ready to reappear at a moment’s notice. Of course, if you would like to make the ancient Creature a more permanent fixture, you can always pay three fate to play it as you would any other conflict character. This versatility and changeable approach can make the Feral Ningyo extremely dangerous. While the Great Clans are often the focus of the intrigue at the heart of Rokugan, they are far from the only participants. The Emerald Empire is populated with minor clans who accept their role as smaller players in the epic drama of Rokugan. One minor clan in particular, however, no longer wants to sit on the sidelines and they have begun their machinations to rise up and stand as equals to the seven Great Clans. 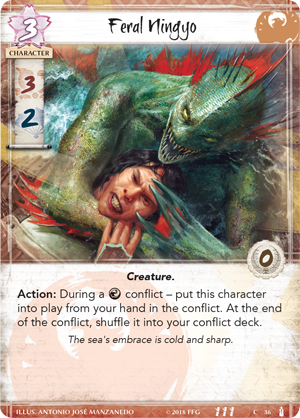 Scattered within the Elemental Cycle are neutral cards representing the Mantis Clan. These cards expand on the themes of the set, many of which relate to a specific element. The exception is the Mantis Clan’s fearless leader, who is able to support any clan regardless of the plans of the elements. Even aside from the Mantis Clan, you can look for neutral cards throughout this cycle representing terrifying Shadowlands monstrosities, forgotten Spirits, and more. Every clan uses the elements in their own way. Though they all feature wise Shugenja and powerful spells, the flavor of each is incredibly different, and this is something that the Elemental Cycle will explore in depth. For example, the Fū Sui Disciple is a Crane Shugenja focused on the Air element. As an Action, the player who has claimed the Air Ring selects one of their ordinary characters (a character that is neither honored or dishonored). Then, you choose to either honor or dishonor that character. 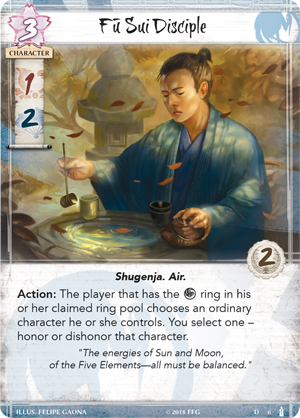 Unlike many of the Shugenja found in Rokugan, Fū Sui Disciple’s (Breath of the Kami, 6) ability is beneficial no matter who has claimed the Air Ring. Honoring one of your own characters is a major bonus if you have claimed the Air Ring, but the ability to dishonor an opponent’s character can be just as strong. Granted, your opponent will select the character, but it will be a difficult choice to make for most clans. Using the Air Ring to honor or dishonor characters is distinctly Crane, and it's the perfect complement to one of their primary themes. You'll also find in the Elemental Cycle a full cycle of powerful province cards with a strength that's boosted based on your clan’s role. For example, Upholding Authority (Tainted Lands, 23) is a three strength province that becomes a five strength province while your clan has an Earth role. 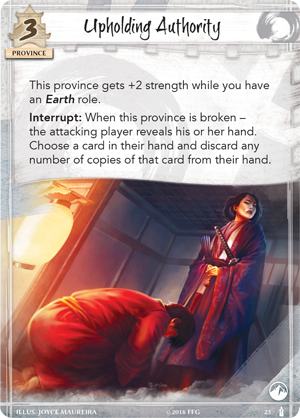 This initially makes Upholding Authority a difficult province to break, and if your opponent manages to accomplish the feat, you can choose a card in their hand and discard all copies of it. You've still lost a province, but Upholding Authority can open the window for a massive counterattack if you're able to discard an important conflict card from your opponent’s hand. With the elements out of balance, the world of Rokugan is changing. But due to ever-increasing tension between the clans, few have noticed. The Lion and the Crane still quarrel, the Unicorn’s meishōdō magic has been censured, and behind the scenes, the Scorpion continue to scheme. With internal strife between the clans, will there be anyone left to defend the land of Rokugan itself? Find out with the Elemental Cycle, featuring Breath of the Kami (L5C09), Tainted Lands (L5C10), The Fires Within (L5C11), The Ebb and Flow (L5C12), All and Nothing (L5C13), and Elements Unbound (L5C14), available for pre-order now from your local retailer or our website!